ChargeDesk helps you manage your customers inside your helpdesk. You need to connect both your gateway and your helpdesk to ChargeDesk for this to work. Your company checklist is the easiest way to setup your company. Your company checklist will guide you through setting up your company. Sign in to show your company settings here. Once your account is setup you can then start managing your customers inside your helpdesk. ChargeDesk automatically finds customers which match the support tickets you receive. The app will search based on a number of factors including the customer's email address, name, phone number and in some cases, email domain. Your Helpdesk App Settings changes how the ChargeDesk app works inside your helpdesk. You change how customers are mapped from this page. Sign in to show your app settings here. 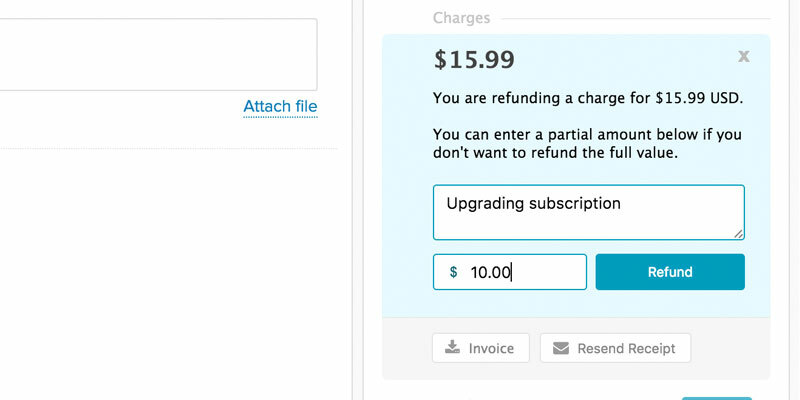 To refund a charge, you just need to click the refund button on a charge inside the ChargeDesk app. This will show the a screen like the one above where you can optionally enter a reason for the refund and the amount you would like to refund. If you enter a reason it will be recorded in the log for the charge and available in the downloadable reports. If you would like to perform a partial refund, enter an amount smaller than the total charge amount. Otherwise if you leave the default amount, a full refund will be performed. When you click the "refund" button next to the amount, the charge will then be imediately refunded on your payment gateway. If for some reason the refund fails to be processed you will receive a notification of why it did not go through. Canceling subscriptions works a similar to refunding charges. You just need to click on the 'cancel' button on a subscription to see a screen similar to the one above. You can optionally enter a reason for the cancellation which will be logged. This reason is not shown to the user. 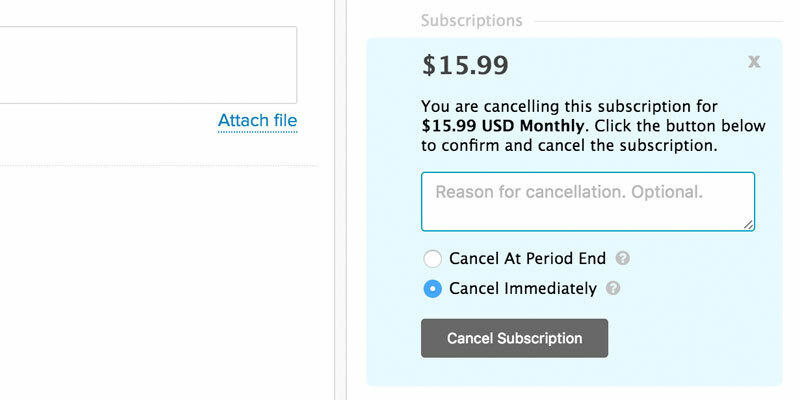 For some gateways you can choose to cancel the subscription either imediately or at the end of the current billing period. Canceling at the end of the currency billing period will put the subscription into a pending cancellation state. The subscription can then be reactivated, if needed, before the end of this period. 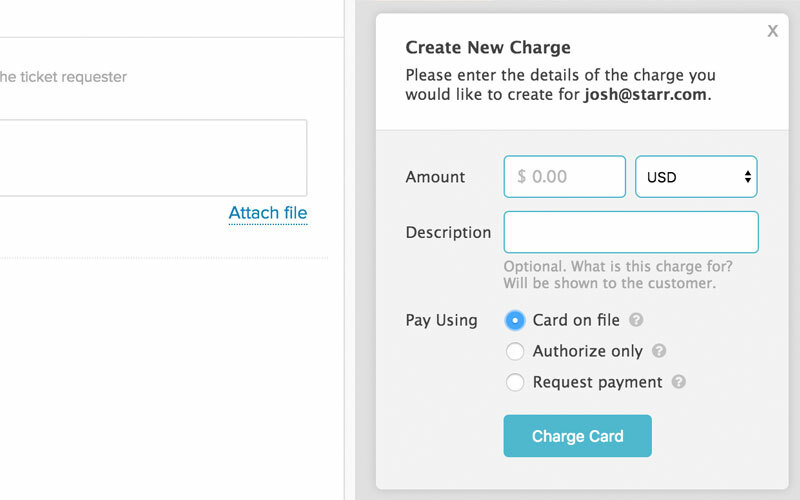 You can create a charge for a customer by clicking on the "New Charge" button under the customer's name. This will bring up the panel shown above. If a customer has a valid card on file, you can create a new charge against this card. Alternatively you can select "Request payment". This will email the customer an invoice asking them to submit their payment details. These details will be saved to your payment gateway and you will be able to make future charges against the customer without requesting the payment each time. The description field will be shown to the customer and included in PDF invoices if activated. That's a quick guide to get you started. 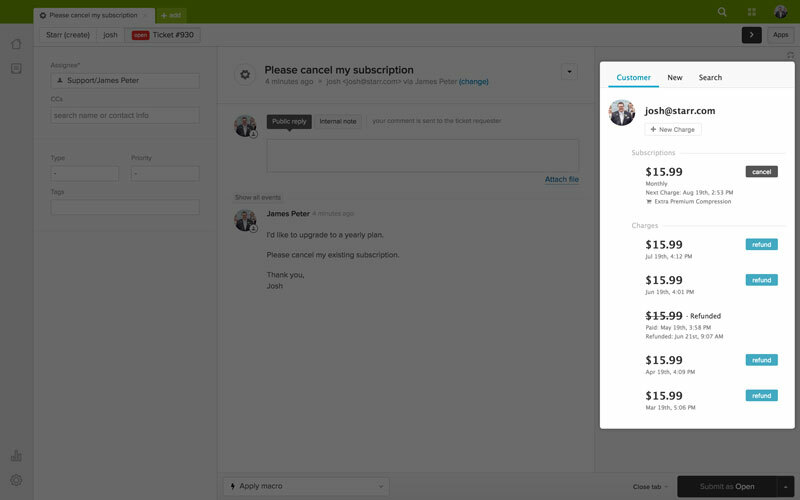 ChargeDesk also has other features including invoicing, reporting and showing billing history to customers. If you have any questions as you get used to ChargeDesk, please ask us any time!